- Quand en société vous voudrez bien recevoir un énorme coup de poing, placez-vous comme ceci! ... 1847. English: - If, in public, you would like to get a good hit, you stand like this! - Sorry, professor, but actually I would prefer not to be hit at all. - This would be against the rules of the art, and besides, you would have no reason to hit back! Many French citizens took up boxing, a sport that had been introduced from England in the early nineteenth century. 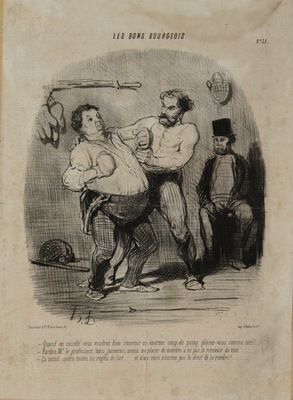 The portly amateur in the lithograph seems a poor fit for the spot, especially in comparison to his rugged trainer.